AS THE ASSOCIATED PRESS REPORTED, it took 78 years for a European player to win the PGA Championship. That man was Padraig Harrington at Oakland Hills in 2008. This year, if another European player wins the season's final major, it will be the first time Europe has collected three of the four majors. Will Rory McIlroy do it? The Northern Irishman who has won his last two starts--the Open Championship and the WGC-Bridgestone Inviational--is the favorite at Valhalla. 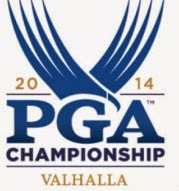 Here are the 2014 PGA Championship odds courtesy of Bovada. well, I noticed Tiger is 28/1. And of this posting he has not withdrawn from the PGA. Bet Tiger wishes he had all those wasted yrs going through countless swing changes back. It's my belief, Tiger was good for 25 majors with the swing he came to the PGA tour with. And now, with the end quickly approaching Woods unhealthy for the past couple of yrs is not even willing to heal before getting back on the course. He has no chance of winning the PGA but somehow his ego has him convinced that even with a broke back he should play. Greed & Perfection most often make a tragic road. I agree. It sure doesn't seem like Tiger should play after last Sunday. No WD a day before the tournament would seem to indicate he wants to find a way to tee it up at Valhalla, if at all possible. If he comes here, he better avoid the rough!